Board Rules: Board Rule 279.2 defines the requirements for a contact lens prescription, release and verification. Federal Law: The Fairness to Contact Lens Consumers Act, effective February 2004, applies to licensees of the Texas Optometry Board. See link to Board Rule 279.2 above. The Federal Trade Commission has issued rules governing the release of contact lens prescriptions. FTC Rules (warning: this is a 118 page document). State Law: The Contact Lens Prescription Act sets out the requirements for a contact lens prescription and release. Board Rule 279.2 incorporates these requirements (see above). Questions: The August 2014, 2011 and 2007 Newsletters answer the most frequent questions regarding contact lens prescription release. Board Rules: Board Rule 279.4 defines the requirements for a spectacle prescription. State Law: Section 351.365 of the Texas Optometry Act sets out the requirements for the release of a prescription for spectacles. The Federal Trade Commission has also issued rules governing the release of spectacle prescriptions. 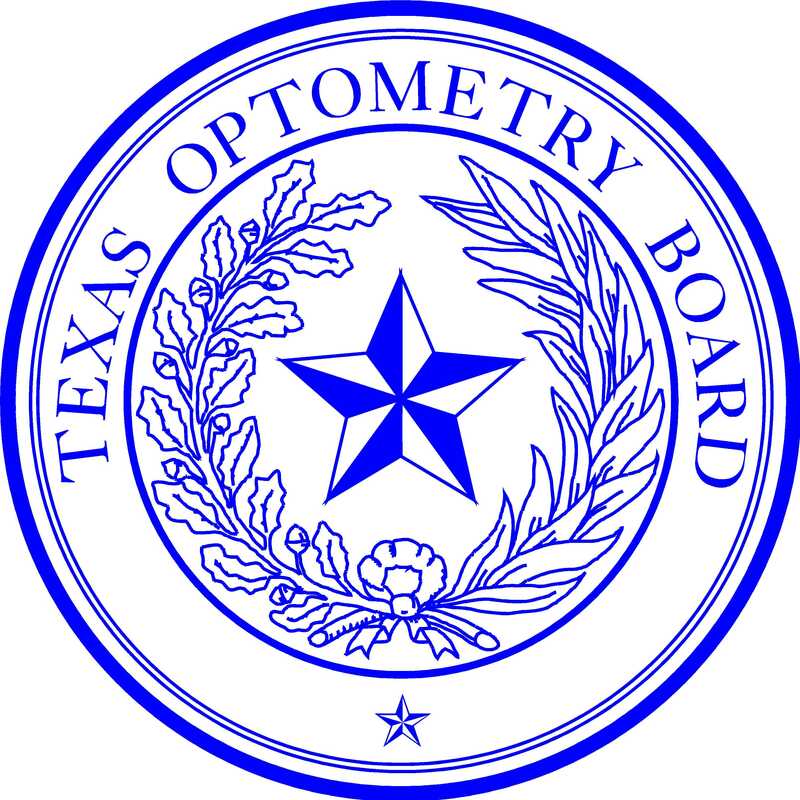 Section 351.365 of the Texas Optometry Act incorporates part of the FTC Rules (16 CFR Part 456). See also discussion of FTC Rule in August 2002 Newsletter. Board Rules: Board Rule 280.5 sets out the requirements for the prescribing of topical prescription drugs, including categories of drugs that may be prescribed. The rule also sets out the procedure to prohibit substitution of generic drugs (subsection (b)), as well as the other requirements for writing a prescription (subsection (c)). Board Rules: Board Rule 280.10 sets out the requirements for prescribing topical anti-glaucoma drugs, and oral prescription drugs, including categories of drugs that may be prescribed and limits on dosage. See Rule 280.5 (above) for other requirements of a drug prescription. NOTE: See important information below concerning the Prescription Monitoring Program. The practitioner’s current and valid DPS registration number for practitioners licensed in Texas. The DPS registration number must belong to the practitioner issuing the prescription; the prescribing practitioner may be a properly registered physician’s assistant or an advanced practice nurse on Schedules III-V prescriptions. The Department of Public Safety no longer issues a Controlled Substance Permit. State law imposes duties on health professionals, including Optometric Glaucoma Specialists, to combat the abuse of opioids. One duty is to query the Prescription Monitoring Program (PMP) before prescribing an analgesic that is a controlled substance (an Optometric Glaucoma Specialist may prescribe one three-day supply of any analgesic identified in Schedules III, IV, and V). See the August 2018 Newsletter for detailed information, including a copy of the proposed amendments to Board Rule 280.10. Optometric Glaucoma Specialists may now register with the PMP and query the database. Registration and query will be required by state law for Controlled Substance prescriptions written after August 31, 2019. Licensees may register and query the PMP now. Requirements: Current Federal Requirements as published by the Centers for Medicare & Medicaid Services: “Starting on October 1, 2008, in order for Medicaid outpatient drugs to be reimbursable by the federal government, all written, non-electronic prescriptions must contain at least three tamper-resistant features, one from each of the three baseline characteristics outlined in guidance issued by the Centers for Medicare & Medicaid Services.” The Texas Health and Human Services Commission has issued a guidance document with detailed information on the requirement. The requirement does not apply to telephone, e-mail or faxed prescriptions. Questions: Centers for Medicare and Medicaid Services and Texas Pharmacy Board. Procedure: A DEA Controlled Substance Registration is only required if the licensee prescribes or administers controlled substances. See Board Rules 280.5 and 280.10. Note: The Texas Department of Public Safety no longer issues a controlled substances permit. To obtain a DEA number, apply to the DEA: National: 800-882-9539; Dallas: 888-336-4704; Houston: 800-743-0595, or use the Internet address. Call the Board if you are unsure of the schedules you are authorized to prescribe. If you are currently licensed as an optometric glaucoma specialist, an authorized schedule is available. Requirements: There are fees and record keeping requirements involved. DEA Numbers should be protected from misuse. Requirements: Computer generated signatures are permissible, but only if the guidelines in Rules 279.2, 279.4 and 280.5 are followed. The rules do not authorize the use of rubber stamped signatures. See page 7 of the August 2013 Newsletter.